In many ways the oil industry is a fashion industry, and in 2011 the exciting new model on the investment bankers’ catwalk was the Duvernay shale. Over $2 billion was spent acquiring big land packages, and the rising price per acre kept the play in the news headlines. Covering over 100,000 km2 along the edges of the foothills of the Canadian Rockies, it’s the source rock for almost all the pools of oil that have created fortunes for Alberta oilmen. Canada's second largest brokerage firm, BMO Nesbit Burns, says the highly productive wet gas window in the Duvernay is 7500 km2–that’s 30% larger than the EagleFord wet gas, or liquid rich, area. It’s huge—no, it’s colossal. It’s over-pressured, and has a high organic content—all the right signs for a great “resource play." And some recent drill holes have shown it to be very promising. The industry says it could hold 750 TRILLION cubic feet of gas with high liquid rich numbers to make it all economic. And the first OIL well in the Duvernay just came up with some intriguing numbers as well. Now, in 2012, the news has gone quiet as everyone drills their first few wells. But the make-or-break economics are starting to become public. "All the wells reported to date have produced hydrocarbons," says Ray Smith, CEO of Bellatrix Explorations (BXE-TSX), the only junior to drill and report a 100% owned Duvernay well. "So I'm encouraged. And as the play develops there will be improved recovery and reductions in cost." But there just haven't been enough data produced to judge the economics on the play. The juniors want to see the data so they can gauge how much their Duvernay rights are worth. The gassy juniors in particular are very cash strapped now, and selling their Duvernay rights is a big lifeline for them. The Canadian majors involved in the play—Encana (ECA-TSX;NYSE), Talisman (TLM-TSX;NYSE) and Husky (HSE-TSX)—have had struggling stocks for the last two years (or more). But the Duvernay is big enough that it could get them back into analysts’ and investors' good books. Here’s an update on what has been happening so far in 2012, and what investors can expect later this year. Land Strategy or Sell Out? The Duvernay has seen limited drilling and public disclosure regarding well results. In 2011, 17 horizontals and 13 vertical test wells were drilled and only a handful have been drilled thus far in 2012. But while drilling has been limited, land sales and transactions have not. The majority of Duvernay sales in 2012 are from juniors, who, for the most part, fluked into their Duvernay rights chasing other plays (though a couple did have insight & bought them). Like I said, these guys need money, and selling or farming out their Duvernay can be easy, and significant, money. In February of 2012 Sonde Resources (SOQ-TSX) sold 24,000 acres of undeveloped Duvernay acreage with no booked reserves for $75 million or ~$3,000/acre. Even the Aussies are getting into the Duvernay. Australian-listed Tamaska (TMK-ASXE), Transerv (TSV-ASX) and Mako Energy (MKE-ASX) sold 80% of 19,200 acres of Duvernay and Rock Creek rights for ~$20 million ($1,300/acre)—also in February. This joint partnership still controls 100% interest in 103 sections of Duvernay shale. In April 2012 Petrobakken (PBN-TSX.T) sold 46.5 net sections of its Duvernay rights for $82.5 million to an undisclosed party, but rumoured to be to Shell (RDS.A-NYSE). This was in one of the best areas to date in the Duvernay, called Kaybob. Petrobakken still retained 190 net sections there. Progress Energy (PGN-NYSE) is currently looking to sell 75.2 net sections of Duvernay rights and Terra Energy (TT-TSX) is trying to divest over 53,000 acres of Duvernay acreage as well. Canadian brokerage firm Macquarie Tristone is leading Terra Energy’s divestiture and believes average land sale prices for Duvernay rights in Terra Energy’s area have climbed from $$1,783/acre in 2010 to over $4,000/acre in 2011. Macquarie went on to state that B&G Energy Ltd. sold 73 sections of Duvernay rights for $2,968/acre in September 2011. 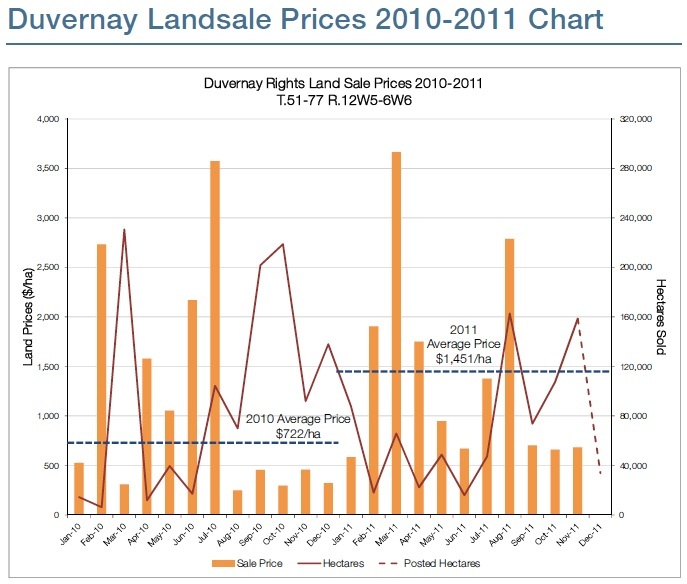 The graph below from Macquarie Tristone shows the increase in Duvernay land values over the last two years. There’s no doubt that Duvernay will be a Big Boy’s game, requiring large acreage positions and even larger amounts of capital. Even with scale, Duvernay wells will likely cost $8-$10 million, and early results have topped $15 million. The high amount of capital, low gas prices and uncertain recovery rates are pricing juniors out of the Duvernay market. Chevron (CVX-. NYSE), Encana, Husky and Talisman all currently have small tight lipped drill programs in progress in the Duvernay formation, but all have been bullish on increasing exposure to oil and liquids-rich gas. US oil giant ConocoPhillips (COP-NYSE) also has a surprisingly large Duvernay position, inherited when it bought Gulf Canada. 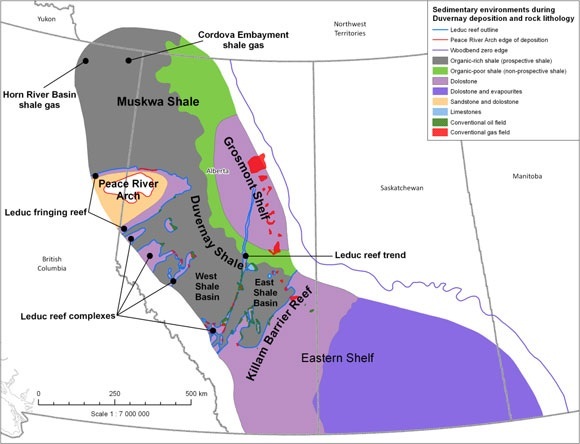 Encana has recently suggested Duvernay condensate yields in the 75-300 bbl/mmcf/d, based on a single vertical well that tested for three months at the high end of this range. To help understand this, think of it this way—a liquid rich gas well that produces 5 million cubic feet a day of gas and has 300 barrels of condensate per million cubic feet of gas…..well, you just multiply 300 x 5 =1500 barrels of condensate a day. And condensate often gets a better price than oil. So that’s 1500 barrels of oil a day, and the gas is free—a loss leader if you want to call it that. That’s a great well! But how consistent can results like that be over such a large area? How patchy is it? Is there a small, core, sweet spot with good results and the rest is just average (which in the expensive Duvernay, is poor). In late 2012 the market will find out. Encana plans to drill six horizontal wells in Q1/Q2 (they are looking for a JV partner). Talisman also has plans for an additional six horizontals in 2012. 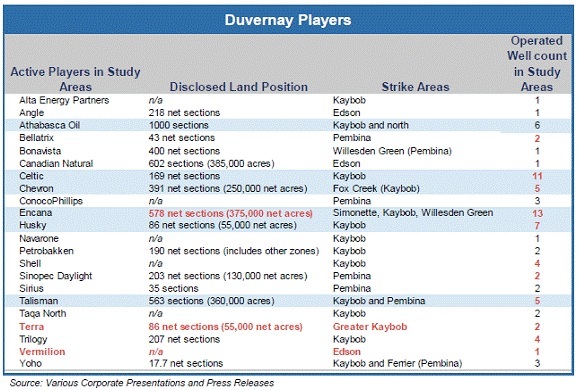 The table below illustrates how limited the drilling has been in the Duvernay but highlights the land positions of the active players in the Duvernay. Read more at Oil and Gas Investments' website.